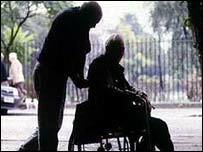 Care workers in England who look after the elderly, vulnerable adults and children could face vetting in an attempt to crack down on abuse. Care Services Minister Liam Byrne has asked the General Social Care Council to look into a way of introducing a system of registration and training. More than 1.6m people work in social care, but only one in four - mostly social workers - have formal training. A report recently revealed the elderly face bullying, neglect and violence. The Help the Aged study suggested as many as 500,000 were abused at any one time with carers as well as families and friends being responsible. Mr Byrne, who has also unveiled a £600,000 research project to look at elderly abuse, said registration should improve safety. "It will enable older people and their families to have complete confidence in the people who are for them, or their loved ones. "Registration is about public safety. "It will allow us to train our care workers to look after our vulnerable people properly." The social care workforce includes social workers, nursing home workers and home-help staff who work for 30,000 companies, councils and charities. But to date, the only formal registration in place is for social workers. Mr Byrne added: "We know there are lots of excellent care workers out there, and they are the mainstay of our society. "Their dedication should be recognised with professional registration. "However, they are not yet a world-class workforce." The announcement comes as a report by the Commission for Social Care Inspection found nearly half of England's nursing and care homes fail to meet minimum drug prescribing standards by giving the wrong medication, wrong dose or no drugs at all. Gary Fitzgerald, chief executive of Action on Elder Abuse, said registration would help improved prescribing, but added the benefits went much further than that. "Registration is something we have called for for a while. It will help improve the standards of staff and, hopefully, will help change the attitude and approach to elderly people." But he said the registration scheme had to be introduced with a "stronger and more robust" inspection system. Clive Evers, director of information and education at the Alzheimer's Society, said the registration could benefit people with Alzheimer's. "Despite the specialist skills required to care for a person with dementia, only a very small proportion of care staff currently receive adequate training. "The society estimates that even though three quarters of people in care homes have some form of dementia, only 10% of care home staff have any training." And he added: "Registration may also help to raise the status of social care staff. We need a cultural shift towards placing a higher value on care work, which is currently an under paid, under trained, under valued sector."